The holidays are an exciting time of the year for the whole family, but the festive food and decorations can sometimes be dangerous for your furry family members. With the holiday season just around the corner, it’s important for pet owners to consider the safety of their pets when they are enjoying the festivities. 1. Maintain your pet’s schedule. Though things may get busy in your household, it’s important to remain consistent with your pets’ eating and exercise schedules. Your pets thrive on routine and may feel neglected if their schedule is disrupted too much. 2. Keep holiday decorations out of reach. Tree decorations can look a lot like toys to your pets. Make sure that any glass ornaments or tinsel are hung higher on the tree so that they do not cause temptation. Ingesting tinsel or broken ornament pieces can have serious health consequences for animals. Also, secure any strands of tree lights or other wires to avoid shock hazards or other potentially dangerous situations. 3. Do not leave burning candles unattended. A scented candle makes a lovely addition to the holidays, but left unattended, burning candles can become a serious hazard as pets may knock them down causing a fire or severe burns. Keep an eye on your pets when they are around candles, and extinguish all flames when you leave the room. 4. Restrict your pets’ access to holiday plants. Many holiday plants are toxic to animals. Holly, mistletoe, and a variety of lilies can cause a number of serious health issues for your pet. Keep these plants out of areas that your pets have easy access to or opt to use more pet-friendly plants. 5. Avoid sharing holiday treats with your pets. Though special treats may make the holiday season, they can also cause digestive problems for your pets. Avoid sharing these treats with your animal companions, and be sure to let your guests know the “house rules” about feeding your pets scraps from the table. 6. Be mindful of your pets when you have visitors. Typically, your home will see more visitors during the holidays. This increased traffic may cause stress for your pets. Make sure that your pets have a quiet place to retreat to when the holiday excitement becomes too much. 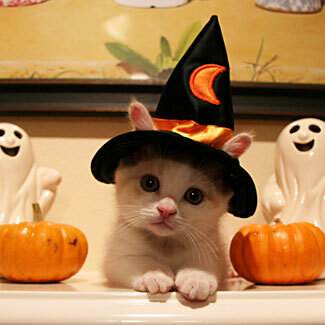 It’s more fun to answer the ringing doorbell on Halloween when your pet is dressed in a fun Halloween costume. Waiting eagerly to greet happy trick-or-treaters, your dog has no idea how cute he is, and of course ,the cat doesn’t care. Little kids squeal with surprise and parents laugh hysterically as the door opens to find a canine pirate or ballerina, tiny cat clown or barking shark, miniature Pope, or even a dog in a Luke Skywalker or Chewbacca costume. Which look does your pet prefer? Glamorous, humorous, silly or scary? You can’t go wrong when your kitty is dolled up in a Red Riding Hood costume or your puppy is decked out in a Michael Jackson wig. If scary is the look you want, check out the monster costumes or Tyrannosaurus Rex. There are hundreds of different costume choices and ideas no matter how big or small your pet. If you’ve got a finicky animal, you might try something light like a scarf or set of moose ears. If your pet loves the idea of strutting her stuff, you can’t go wrong with a full set of jewelry and a tiara. And if your dog is the man of the house, send him to the door to delight the kids fully dressed in a doggie tuxedo, complete with bow tie collar. If your pet doesn’t mind and won’t be insulted, try a food suit. How about a taco, hot dog, or banana split? And don’t forget, you and your pet can wear fun and fabulous matching costumes to Halloween parties and to delight your neighborhood trick-or-treaters. Today we have a few great Skin-eze testimonials to share. We love hearing about how Skin-eze has helped your pets. If you have a story to share, please feel free to leave a comment! Without further ado, onto some Skin-eze reviews. We have been fostering a severely abused golden retriever with tremendous skin issues including allergies, puncture wounds, dry, itchy skin, hair loss, scarring, dry spots, et al. Between the bathing several times weekly, the change in diet (he was severely underweight), the meds from the vet and the Skin-eze, he has made a remarkable recovery. We ran out of the Skin-eze 2 days ago and he’s scratching constantly which he hadn’t been doing after a week on the capsules when we first started. I cannot say enough good things about these products. It truly works. It is a relief not to depend on harsh chemicals and vet prescriptions. Thank you so much. It really works!! I was able to decrease the daily amount for a few weeks but had to recently increase. Hope it takes all the itchiness away! He is only 6 months old and I did not want to go the traditional route. So blessed to have found your website!! !